Welcome to the website that's all about Minburn: A Small Town with a Big Heart, brought to you by the Minburn Community Betterment Group. 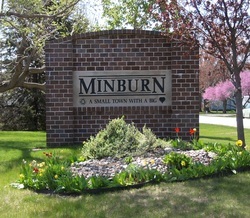 Minburn is in the loop! The Raccoon River Bike Trail loop that is. Don't forget - the trail portion in town is open to all. You need a permit to ride/walk the portion out of the City limits. The Raccoon River Bike Trail new 33-mile 'North Loop' connects our community, along with Dallas Center, Perry, Dawson and Jamaica with the existing 56 miles of the RRVT, winding from Jefferson through Panora, to Adel, Waukee and Clive. Minburn is on Highway 169, in the heart of Dallas County. You'll find a grain elevator, church, two veterinarians, library, phone company and bank, with a wonderful nature preserve just west on F31. You can get a free cup of coffee at the bank, Heartland Coop, or at the library.